Micro-inverters operating into the single-phase grid from new energy source with low-voltage output face the challenges of efficiency bottleneck and twice-line-frequency variation. 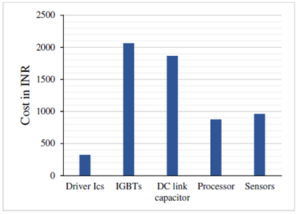 This paper proposed a multilevel inverter based on bridge modular switched-capacitor (BMSC) circuits with its superiority in conversion efficiency and power density. The topology is composed of DC-DC and DC-AC stages with independent control for each stage, aiming to improve system stability and simplify the control method. The BMSC DC-DC stage, which can be expanded to synthesize more levels, not only features multilevel voltage gain but also partially replaces the original bulk input capacitor and functions as an active energy buffer to enhance power decoupling ability between DC and AC sides. In DC-AC stage, the control strategy of optimized unipolar frequency doubling sine-wave pulse-width modulation (UFD-SPWM) is proposed to improve the quality of output waveform. Meanwhile, the multilevel voltage phase has been optimized to reduce the power loss further. Finally, a prototype has been built and tested. Associated with the simulation, the experimental results validate the practicability of these analyses. Optimized unipolar frequency doubling SPWM. Fig.1 Topology of the proposed converter. (a) General topology of bridge modular switched-capacitor-based multilevel inverter (b) Seven-level inverter. 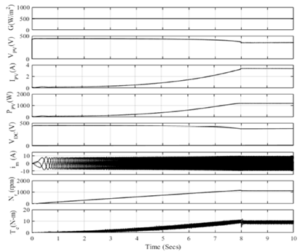 Fig.2 Simulation waveforms of seven-level inverter. (a) Us1_DS, Us3_DS, Us1a_DS and Us2a_DS. (b) UC2a, Ud, UX, Uo and io. (c) Spectrum of Uo. 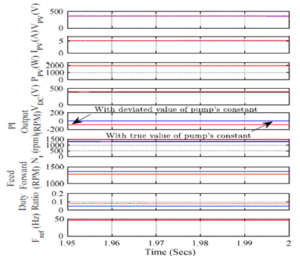 Fig.3 Simulation comparison of power decoupling ability at different Cin. Under proposed control strategy:(a)Ui and Po. (b)Ud and Po. Under conventional control strategy:(c) Ui and Po. (d) Ud and Po. 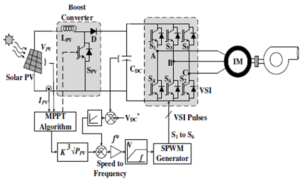 M. Jun, “A new selective loop bias mapping phase disposition PWM with dynamic voltage balance capability for modular multilevel converter,” IEEE Trans. Ind. Electron., vol. 61, no. 2, pp. 798-807, Feb. 2014. N. Mehdi, and G. Moschopoulos, “A novel single-stage multilevel type full-bridge converter,” IEEE Trans. Ind. Electron., vol. 60, no. 1, pp. 31-42, Jan. 2013. E. Ehsan and N. B. Mariun, “Experimental results of 47-level switchladder multilevel inverter,” IEEE Trans. Ind. Electron., vol. 60, no. 11, pp. 4960-4967, Nov. 2013. J. Lai, “Power conditioning circuit topologies,” IEEE Trans. Ind. Electron., vol. 3, no. 2, pp. 24-34, Jun. 2009. L. He, C. Cheng, “Flying-Capacitor-Clamped Five-Level Inverter Based on Switched-Capacitor Topology,” IEEE Trans. Ind. Electron., vol. 63, no.12, pp. 7814-7822, Sep. 2016. A simple and efficient solar photovoltaic (PV) water pumping system utilizing an induction motor drive (IMD) is presented in this paper. This solar PV water pumping system comprises of two stages of power conversion. The first stage extracts the maximum power from a solar PV array by controlling the duty ratio of a DC-DC boost converter. The DC bus voltage is maintained by the controlling the motor speed. This regulation helps in reduction of motor losses because of reduction in motor currents at higher voltage for same power injection. To control the duty ratio, an incremental conductance (INC) based maximum power point tracking (MPPT) control technique is utilized. A scalar controlled voltage source inverter (VSI) serves the purpose of operating an IMD. 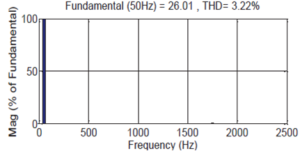 The stator frequency reference of IMD is generated by the proposed control scheme. The proposed system is modeled and its performance is simulated in detail. The scalar control eliminates the requirement of speed sensor/encoder. Precisely, the need of motor current sensor is also eliminated. Moreover, the dynamics are improved by an additional speed feedforward term in the control scheme. The proposed control scheme makes the system inherently immune to the pump’s constant variation. The prototype of PV powered IMD emulating the pump characteristics, is developed in the laboratory to examine the performance under different operating conditions. The standalone photovoltaic water pumping system with reduced sensor, has been proposed. It utilizes only three sensors. The reference speed generation for V/f control scheme has been proposed based on the available power the regulating the active power at DC bus. 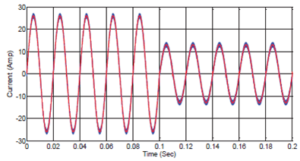 The PWM frequency and pump affinity law have been used to control the speed of an induction motor drive. Its feasibility of operation has been verified through simulation and experimental validation. Various performance conditions such as starting, variation in radiation and steady state have been experimentally verified and found to be satisfactory. The main contribution of the proposed control scheme is that it is inherently, immune to the error in estimation of pump’s constant. The system tracks the MPP with acceptable tolerance even at varying radiation. Drury, T. Jenkin, D. Jordan, and R. Margolis, “Photovoltaic investment risk and uncertainty for residential customers,” IEEE J. Photovoltaics, vol. 4, no. 1, pp. 278–284, Jan. 2014. 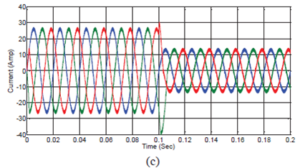 Muljadi, “PV water pumping with a peak-power tracker using a simple six-step square-wave inverter,” IEEE Trans. on Ind. Appl., vol. 33, no. 3, pp. 714-721, May-Jun 1997. Sharma, S. Kumar and B. Singh, “Solar array fed water pumping system using induction motor drive,” 1st IEEE Intern. Conf. on Power Electronics, Intelligent Control and Energy Systems (ICPEICES), Delhi, 2016. Franklin, J. Cerqueira and E. de Santana, “Fuzzy and PI controllers in pumping water system using photovoltaic electric generation,” IEEE Trans. Latin America, vol. 12, no. 6, pp. 1049-1054, Sept. 2014. Kumar and B. Singh, “BLDC Motor-Driven Solar PV Array-Fed Water Pumping System Employing Zeta Converter,” IEEE Trans. Ind. Appl., vol. 52, no. 3, pp. 2315-2322, May-June 2016. Shunt active power filter is the preeminent solution against nonlinear loads, current harmonics and power quality problems. 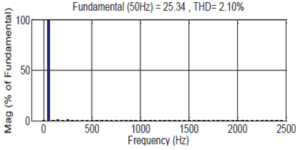 APF topologies for harmonic compensation use numerous high-power rating components and are therefore disadvantageous. Hybrid topologies combining low-power rating APF with passive filters are used to reduce the power rating of voltage source inverter. Hybrid APF topologies for high-power rating systems use a transformer with large numbers of passive components. In this paper, a novel four-switch two-leg VSI topology for a three-phase SAPF is proposed for reducing the system cost and size. The proposed topology comprises a two-arm bridge structure, four switches, coupling inductors, and sets of LC PFs. The third leg of the three-phase VSI is removed by eliminating the set of power switching devices, thereby directly connecting the phase with the negative terminals of the dc-link capacitor. The proposed topology enhances the harmonic compensation capability and provides complete reactive power compensation compared with conventional APF topologies. The new experimental prototype is tested in the laboratory to verify the results in terms of total harmonic distortion, balanced supply current, and harmonic compensation, following the IEEE-519 standard. Fig. 2. Steady state operation of the proposed SAPF a) Utility voltage (THDv=4%) b) Utility current (THDi=4.1%) c) Load current (THDi=30.1%) d) Compensating filter current. Fig. 3. a) DC voltage (50V/div). b) Filter current (100A/div) at filter switched ON (t=0.15). Fig. 4. Starting performance of the proposed SAPF. a) Utility voltage (THDv=4%) b) Utility current (THDi=4.1%) c) Load current (THDi=30.1%) d) Compensating current at switched ON. Fig. 5. a) On-state and Off-state APF operations. b) Zoom image of utility line current (𝒊𝑺𝒂𝒃𝒄) at 5th and 7th order harmonics. Fig. 6. 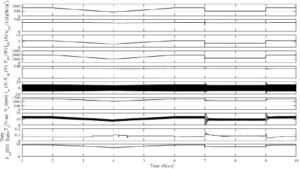 Dynamic performance with the R-L load step-change waveforms of the proposed SAPF. 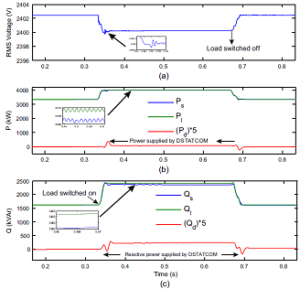 In this paper, a novel three-phase reduced switch count and transformer-less APF circuit, operating with the function of active filtering and enhanced reactive power compensation. The main point of the proposed APF circuit topology, which uses a two-leg bridge structure and only four IGBT power devices in the three-phase power converter. Compared with the other existing topologies, the elimination of the transformer and minimum active and passive component contributes to a significant reduction in the manufacturing cost, volumetric size and weight. The proposed APF system is more robust, efficient and stable to improve the feasibility and harmonic propagation of the power distribution system. A detail analysis of the both the active filter inverter and passive filter, including the reactive power capability and filtering characteristics has been presented. 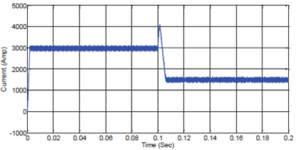 The series LC tuned PF at the 5th and 7th order harmonic frequencies improves the harmonic mitigation performance. However, the series ac coupling inductors can overcome the fixed reactive power compensation caused by the defined value of the LC filter. The control algorithm can ensure the regulated sinusoidal voltage, phase amplitude, and low THD in the power distribution system, along with dc-link voltage control. The experimental and simulation results have verified the feasibility of the proposed APF topology and its excellent performance in terms of both transient and steady states responses to compensate selectively either the reactive power compensation, as well as in damping out the current harmonic distortion. Furthermore, the proposed APF system based on transformerless and power switching device reduced count configuration could be used in extensive applications, such as the grid-connected power converters, grid interfaced distributed energy sources, and so on. S. D. Swain, P. K. Ray, and K. B. Mohanty, “Improvement of Power Quality Using a Robust Hybrid Series Active Power Filter,” IEEE Transactions on Power Electronics, vol. 32, pp. 3490-3498, 2017. 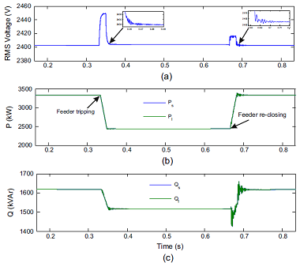 A. Javadi, A. Hamadi, L. Woodward, and K. Al-Haddad, “Experimental Investigation on a Hybrid Series Active Power Compensator to Improve Power Quality of Typical Households,” IEEE Transactions on Industrial Electronics, vol. 63, pp. 4849-4859, 2016. 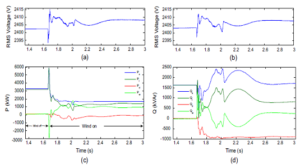 W. U. Tareen, S. Mekhilef, M. Seyedmahmoudian, and B. Horan, “Active power filter (APF) for mitigation of power quality issues in grid integration of wind and photovoltaic energy conversion system,” Renewable and Sustainable Energy Reviews, vol. 70, pp. 635-655, 4// 2017. 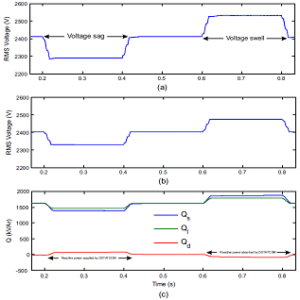 J. Solanki, N. Fröhleke, and J. Böcker, “Implementation of Hybrid Filter for 12-Pulse Thyristor Rectifier Supplying High-Current Variable-Voltage DC Load,” IEEE Transactions on Industrial Electronics, vol. 62, pp. 4691-4701, 2015. 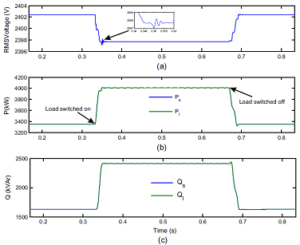 L. Asiminoaei, C. Lascu, F. Blaabjerg, and I. Boldea, “Performance Improvement of Shunt Active Power Filter With Dual Parallel Topology,” IEEE Transactions on Power Electronics, vol. 22, pp. 247-259, 2007. This paper proposes a maximum power point tracking scheme using neural networks for a grid connected photovoltaic system. The system is composed of a photovoltaic array, a boost converter, a three phase inverter and grid. The neural network proposed can predict the required terminal voltage of the array in order to obtain maximum power. The duty cycle is calculated and the boost converter switches are controlled. Hysteresis current technique is applied on the three phase inverter so that the output voltage of the converter remains constant at any required set point. The complete system is simulated using MATLAB/SIMULINK software under sudden weather conditions changes. Results show accurate and fast response of the converter and inverter control and which leads to fast maximum power point tracking. Fig. 3. (a) Temperature, (b) Irradiance, (c) Output power of the array, (d)Terminal voltage of the array. Fig. 4. (a) Reference voltage of inverter control, (b) Voltage at inverter’s DC side. This paper presents a complete control scheme for a grid connected photovoltaic system. The whole system was simulated and the controllers were tested. The proposed maximum power point tracking control using neural networks maintains accurately the maximum power and shows fast dynamic response against sudden environmental condition changes or disturbances. Further research can be carried out in the near future to implement a physical model of the system and to compare the applied scheme with other conventional ones. G. Villalva, J. R. Gazoli and E. Ruppert F. “Analysis and simulation of the P&O MPPT algorithm using alinearized array model”. Power electronics conference, 2009, Brazil. Safri and S. Mekhilef. “Incremental conductance MPPT method for PV systems”. Electrical and Computer Engineering (CCECE). 2011. Canada. I. Sulaiman, T.K. Abdul Rahman, I.Musirin and S.Shaari. “Optimizing Three-layer Neural Network Model for Grid-Connected Photovoltaic output prediction”. Conference on innovative technologies in intelligent systems and industrial applications.2009. Subiyanto, A.Mohamed and M.A.Hannan. “Maximum Power Point Tracking in Grid Connected PV System using A Novel Fuzzy Logic Controller”. IEEE student conference on research and development, 2009. Trishan Esram and Patrick L. Chapman. “Comparison of Photovoltaic Array Maximum Power Point Tracking Techniques. “ IEEE Transactions on energy conversion, Vol.22, NO. 2, 2007. The development of power electronics technology gives ample of opportunity for the grid integration of renewable in an efficient way. Commonly pulse width modulated voltage source inverter is widely used for this purpose. The control technique of grid integrated inverters plays a major role for the reduction of harmonic and improvement of power quality in the system. 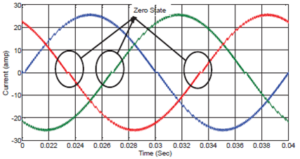 The most commonly used current control technique for the control of the inverter is hysteresis current controller strategies. But the main drawback hysteresis current controller is the uneven switching frequency and higher harmonic distortion. 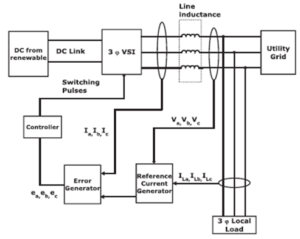 In this paper a hysteresis current controller with offset band for three phase grid integrated pulse width modulated voltage source inverter has been implemented for considerable reduction of harmonic distortion and better power quality. The MATLAB-Simulink environment is used to model, study and simulate the system. The HCC with offset scheme is implemented to achieve lower THD and power quality improvement of the three phase grid connected PWM-VSI. The result obtained from simulation is compared with HCC system. The result reveals that the HCC with offset scheme has lower THD i.e. 2.10% as compared to HCC which is 3.22% and also the average switching frequency is less due to the zero level in the inverter output voltage. The another advantage of HCC with offset scheme is, average value of the current error is smaller as compared to HCC which can be verified by comparing the result of current error of both the schemes. It implies the power quality is superior in case of HCC with offset band. Kroposki, B.; Pink, C.; DeBlasio, R.; Thomas, H.; Simões, M.; Sen, P.K., “Benefits of Power Electronic Interfaces for Distributed Energy Systems,” IEEE Transactions on Energy Conversion, , vol.25, no.3, pp.901-908, Sept.
Sung-Hun Ko; Lee, S.R. ; Dehbonei, H.; Nayar, C.V., “Application of voltage- and current controlled voltage source inverters for distributed generation systems,” IEEE Transactions on Energy Conversion, , vol.21, no.3, pp.782-792, Sept.
G. Holmes, T. A. Lipo, B. P. McGrath, and W. Y. Kong, “Optimised design of stationary frame three phase AC current regulators,” IEEE Trans. Power Electron., vol. 24, no. 11, pp. 2417–2426, Nov. 2009. The distribution static compensator (DSTATCOM) provides fast control of active and reactive powers to enable load compensation, harmonics current elimination, voltage flicker mitigation, voltage and frequency regulation. 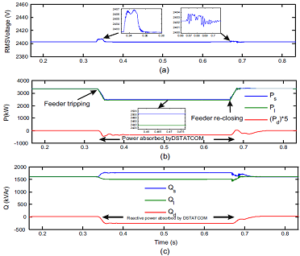 This paper presents power quality improvement technique in the presence of grid disturbances and wind energy penetration using DSTATCOM with battery energy storage system. DSTATCOM control is provided based on synchronous reference frame theory. A modified IEEE 13 bus test feeder with DSTATCOM and wind generator is used for the study. Power quality events during grid disturbances such as feeder tripping and re-closing, voltage sag, swell and load switching have been studied in association with DSTATCOM. The power quality disturbances due to wind generator outage, synchronization and wind speed variations have also been investigated. The study has been carried out using MATLAB/SIMULINK and the simulation results are compared with real time results obtained by the use of real time digital simulator (RTDS) for validating the effectiveness of proposed methodology. The proposed method has been proved to be effective in improvement of power quality with all disturbances stated above. Fig.1. Proposed DSTATCOM with BESS. Fig.5. Load switching with DSTATCOM in the network (a) RMS voltage at bus 632, (b) active power flow and (c) reactive power flow. Fig.6. Voltage sag and swell (a) without DSTATCOM, (b) with DSTATCOM and (c) reactive power flow during voltage sag and swell. Fig. 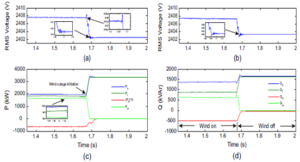 7 Wind synchronization (a) voltage without DSTATCOM, (b) voltage with DSTATCOM, (c) active power flow with DSTATCOM and (d) reactive power flow with DSTATCOM. Fig. 9. Wind speed variation. The proposed research work investigates into PQ events associated with distribution network due to grid disturbances such as voltage sag, swell, load switching, feeder tripping and re-closing. The DSTATCOM has been proposed to improve the power quality in the above events. The proposed DSTATCOM with SRF based control has been proved to be effective in improving the power quality in these events at grid level. The power quality events associated with wind operations such as wind generator outage, grid synchronization of wind generator and wind speed variations have been improved by the use of proposed DSTATCOM in the distribution network. From, these studies it has been established that the DSTATCOM can effectively be used to improve the power quality in the distribution network with wind generation and during grid disturbances. The results have been validated in real time utilizing RTDS. The real time results are very close to the simulation results which shows the effectiveness of proposed DSTATCOM with BESS for improvement of PQ in the distribution system. Ibrahim W, Morcos M. A power quality perspective to system operational diagnosis using fuzzy logic and adaptive techniques. IEEE Trans Power Deliv 2003;18(3):903–9. http://dx.doi.org/10.1109/TPWRD.2003.813885. Ray P, Mohanty S, Kishor N. Classification of power quality disturbances due to environmental characteristics in distributed generation system. IEEE TransSust Energy 2013;4(2):302–13. http://dx.doi.org/10.1109/TSTE.2012.2224678. Tascikaraoglu A, Uzunoglu M, Vural B, Erdinc O. Power quality assessment of wind turbines and comparison with conventional legal regulations: a case study in turkey. Appl Energy 2011;88(5):1864–72. http://dx.doi.org/10.1016/j. apenergy.2010.12.001. Dash P, Padhee M, Barik S. Estimation of power quality indices in distributed generation systems during power islanding conditions. Int J Electr Power Energy Syst 2012;36(1):18–30. http://dx.doi.org/10.1016/j.ijepes.2011.10.019. Mahela OP, Shaik AG, Gupta N. A critical review of detection and classification of power quality events. Renew Sust Energy Rev 2015;41(0):495–505. http:// dx.doi.org/10.1016/j.rser.2014.08.070.